Twitter tells us it’s National French Fry Day. Although I eat fries whenever I feel like now, there was a time fries were the devil. It was when I was addicted to Tab. 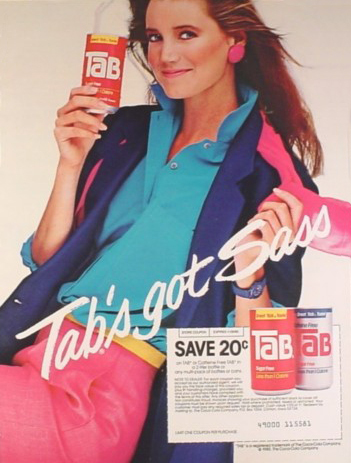 Remember Tab? The most perfect drink ever? The pink can. The burn down the throat on the way down. The perfect pairing with Nacho Cheese Doritos and Peanut M & M’s? Whaaa? College flash: a house filled with sorority sisters mixing the combo for the finest of meals. In the early days, The Norwegian brought six packs of Tab and Peanut M & M’s as gestures of love. My early morning thought process takes on a life of its own: Twitter=fries=Tab=college and off we go to the halcyon days of body obsession, sexual awakening, the foibles of boys and music that had lyrics. We walked everywhere, counted every calorie and exercised like maniacs in order to achieve an unrealistic goal weight and a boy with a popped collar and Ray Bans leaning up against the brick of Dowling or Murray Hall. I know–what the hell were we thinking? We wrote letters home and used pay phones. Secrets remained secret before the Internet. Our hair was big, enormous actually, and sometimes we still long for the ability to rat it to hide the fact it’s dirty and we’re lazy. Scrunchies gave new life to side ponies and some of us still wear them to bed ‘cuz they provide lift without the telltale marks of a hair band. We moved our shoulder pads from one outfit to another if they weren’t big enough. We had to ask the librarian who had the book we needed. And bribe them to give it up. Most of our papers were typewritten and we cursed like crazy when the White Out was dry. We talked on phones with a cord and had to search for the nearest closet if we wanted privacy. We had to follow the phone cord to find the phone later. Joan Jett taught us how to be badass and the B52 girls showed us partying like a rockstar was, in fact, all it was cracked up to be. The Boss anthemed our lives–if you were into pretending you were the tough street kid none of us actually were. We found our friends phone numbers in the giant yellow pages that hung from a solid wire thingy in the phone booth. We wrote them down in our address books. Guys wrote our numbers on their hands. We rarely told our parents our problems and when we left at 18, we didn’t go back home except for summer break. The drinking age was 18 so by 21, we were pretty much over it. ohmigosh…this brings back so many memories! Sounds like UW Eau Claire all over again!